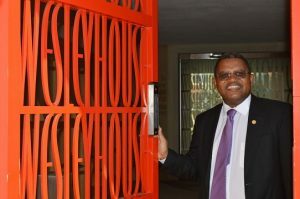 Professor R Simangaliso Kumalo is an Associate Professor of Religion and Governance at the University of KwaZulu-Natal Pietermaritzburg. He is the Director of the Institute for Religion, Governance and the Environment in Southern Africa. He is also the Co-founding Editor of the Critical Investigation on Humanitarian AID in Africa (CIHA). He is also the immediate past-President of the Seth Mokitimi Methodist Seminary in Pietermaritzburg, South Africa (2016-2018). His research focus is on Religion and Governance, Religion and the Environment, Church and Politics and Public Theology and the Social History of Methodism in Southern Africa. He has written four books and over 50 chapters in books and academic journals. Kumalo, R.S. 2003. From Forests to Deserts: A Model of Ministry in Communities of the Poor. Pretoria: UNISA CBPowell Publishers. Kumalo, R. S. Methodists with a White History and a Black Future: The People Called Methodists in KwaZulu-Natal. Johannesburg: Upper Room Ministries. Kumalo R.S. 2012. Pastor and Politician: Essays on the Legacy of John L. Dube the First President of the African National Congress. Pietermaritzburg: Cluster Publications. (Forthcoming) Kumalo, R.S. Convergences of Politics, Religion and Culture in the Burial of Nelson Mandela.